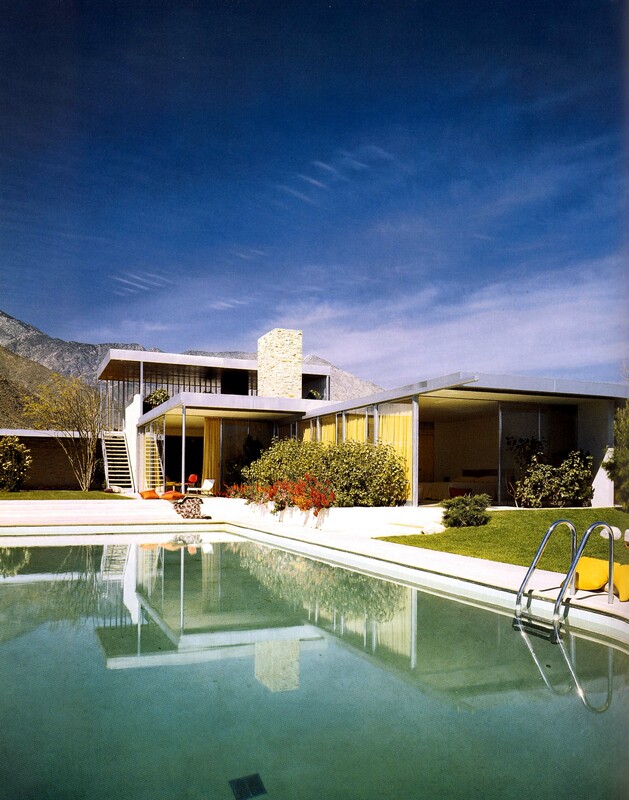 MIT architecture historian Mark Jarzombeck coined the term 'good life modernism' to describe residential architecture and design trends in California and other sunny American States during the 1950s. Richard Neutra's Kaufmann house in Palm Springs, 1946-47 (after restoration work in the 1990s). 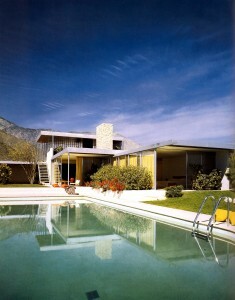 Photo Julius Shulman. This work strongly influenced Snelling's design for the Kelly House 1 in Bellevue Hill, Sydney, which won a House of the Year Award for 1955. Los Angeles and Palm Springs were the global epicentres of hedonistic lifestyles during the decades when the rest of the world was dealing with the Great Depression (1930s) and the Second World War (through to 1945). These two sprawling cities thrived, and provided well-paid employment to people serving the entertainment industry. They were creative engines for growth of the 20th century's most exciting media form: movies. Douglas Snelling, an impressive young opportunist from working class England and provincial New Zealand, discovered Hollywood's thrills during its pre-war Golden Age. He was there for six months in 1937 and 1938 as a freelance sketcher of cartoons of Hollywood actors for mass-market entertainment magazines. On a six month NZ visa, he socialised with many of his subjects, including Errol Flynn, Clark Gable, Laurel and Hardy, Lucille Ball and Shirley Temple. 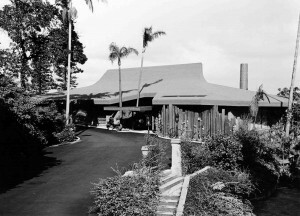 When he returned again to Los Angeles in 1947 and 1948 (by then a successful interior and furniture designer in Sydney), Snelling saw the first flickerings of a massive post-war boom in designing and building houses for new generations of couples who wanted to raise their families in modern, healthy, glamorous and convenient homes. He resolved to be ahead of that game – and decided to interpret the 'organic' (integrated with nature) architectural philosophies of Chicago's legendary Frank Lloyd Wright. Back in Sydney in early 1948, Snelling studied privately to become a registered architect – and to deliver his prosperous clients high-quality interpretations of the latest design concepts and technology innovations from the best Los Angeles practitioners. 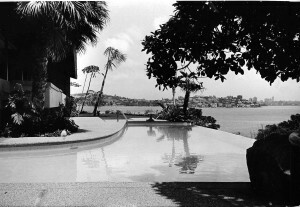 Australia's first infinity pool, built for the Kelly family's residence, Tahiti, at Vaucluse, Sydney, in 1965. Photo Jim Whitelock. Though Jarzombeck did not coin the term 'good life modernism' until much later, Snelling was among the first architects to deliver that ethos of 'the California dream' to the South Pacific. During the 1950s and 1960s, almost every middle class family in Los Angeles (and especially the desert environment of Palm Springs), desired and could afford to install a swimming pool. These became symbols of California modernism – as celebrated in the hedonistic 1970s and 1980s paintings of English emigré artist David Hockney. During the early 1960s, Douglas Snelling built the South Pacific's first 'infinity' (spill-edge) swimming pool at Vaucluse, Sydney; completing it only two years after John Lautner delivered the original to Silver Lake, a north-east Los Angeles suburb, in 1963. 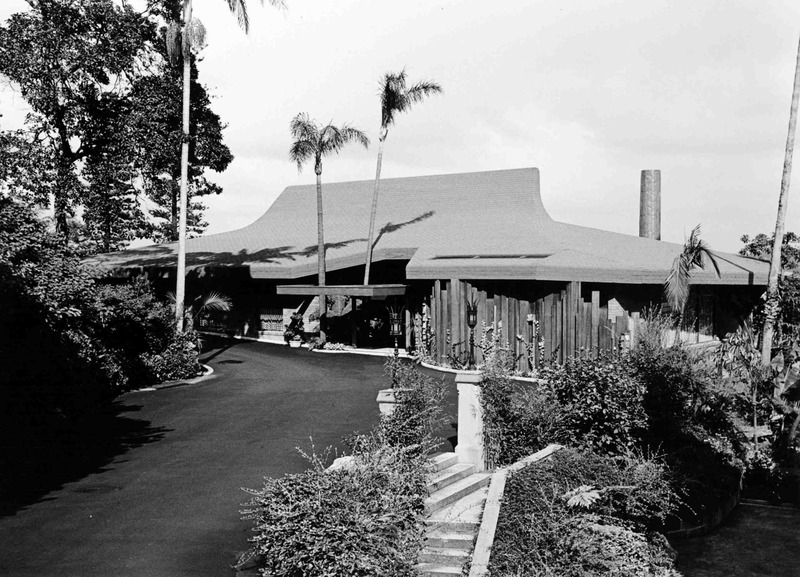 Snelling's first 'thatched' roof, for the Kelly House II in Vaucluse, 1965. Photo Jim Whitelock. From the mid 1960s to the end of his design career in the early 1970s, Snelling's architecture took a 'fantasy island' turn. He began to design exotic imitations of traditional south-west Pacific thatched roofs for his otherwise conventionally modern houses and commercial buildings. These pioneered the 'indigenous modern' design approaches later used by Australian architects Peter Muller and Kerry Hill for their 1990s Amanresorts in Bali, and other architects of palatial late 20th century Asia-Pacific residences and resorts. National Library AU to archive douglas-snelling.com. NZ says no. California rejections of Snelling: was Seidler involved? Was Snelling a temple thief? Cambodia silent. Why are ANZ historians shunning Snelling? Copyright © 2012 Davina Jackson - All Rights Reserved.